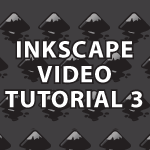 Welcome to part 3 of my Inkscape Video Tutorial. You should watch the previous parts before watching this. Here they are part 1 & 2. In this tutorial I will cover how to use : the Pathfinder Tools, RGB, HSL, CMYK, Blur, Fill, Stroke, Dropper Tool, the Tweak Tool, Dashes, Joints, Gradient Tool, Gradient Options and much more. I packed a ton of information into this one video and I hope you like it. i need strokes that i have not seen in inkscape. is there a way to create custom strokes in inkscape? one of the strokes i seem to need is a variable width stroke. another one is a stroke with tapered ends. You could create a brush as an object. Then use Object → Object to Marker. Then apply the custom marker to a stroke.